Located in the heart of downtown Raleigh, the North Carolina Museum of Natural Sciences is the largest institution of its kind in the southeast U.S. and one of the nation’s most amazing museums about the natural world. The Museum asks four basic questions about the natural sciences—what do we know?, how do we know?, what’s happening now?, how can you get involved?—with an integrated suite of onsite, offsite, online and outdoor experiences. “To illuminate the interdependence of nature and humanity” became the mission of the museum and declares the institution’s purpose, value, and compass for plans and actions. The North Carolina Museum of Natural Sciences is a nexus of research, collections, living collections, exhibitions and digital media, school and lifelong education, community engagement, and a regional network with a remarkable history of public and private sector investments with a growing array of partnerships. One of those partnerships led to the Museum’s current efforts to bring the UN’s Sustainable Development Goals (SDGs) to the attention of communities across North Carolina. The Museum enjoys a close relationship with WRAL TV, a local television company headquartered in the city of Raleigh. Because of a mutual concern for how various environmental challenges, and specifically climate change issues are communicated to the public, the Museum and WRAL have partnered to develop a unique and thoughtful series of town hall meetings. The host and moderator for these programs is WRAL’s lead meteorologist, Greg Fishel, who is well-known and admired in the community is also a member of the Museum’s advisory board. 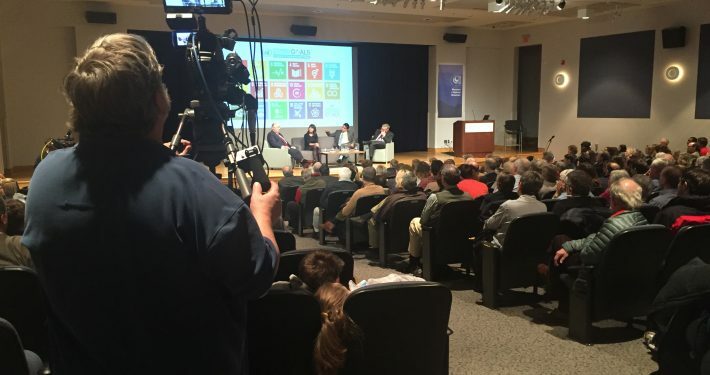 The program series called The Nature of Science: A Town Hall with Greg Fishel, are quarterly live-streamed events that are held at the Museum and that focus on those UN’s Sustainable Development Goals that can be specifically science related (SDGs 2,3,6,7,11,13,14,15). In these programs, our audiences participate in lively Q&A’s, hear about local perspectives, and learn about action steps they can take in their own communities. In January 2016, we introduced the UN SDGs in a program called Forging a Sustainable Future. 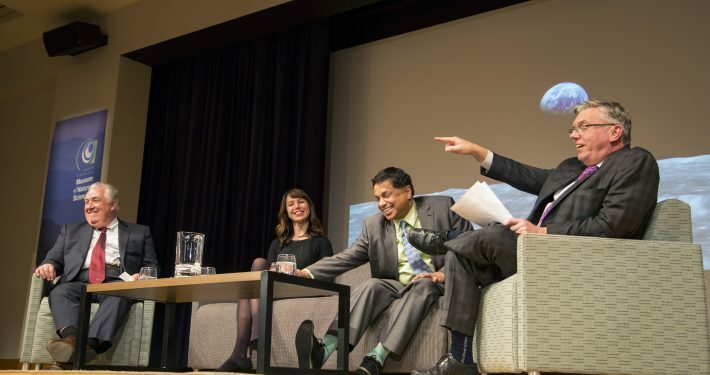 We outlined the UN goals and then engaged the audience in a discussion about how now, more than ever, forging a sustainable future depends on the United Nations and sectors such as universities and museums working in new ways to contribute and communicate a needed base of science and science-related knowledge to the public. Our speakers were Ramu Damodaran, Chief of the United Nations Academic Impact in New York; Lori Foster, Professor of Psychology at NC State University and Fellow with the White House Social and Behavioral Sciences Team. ; and Emlyn Koster, Director of the Museum of Natural Sciences. This first town hall program of 2016 offered the audience an opportunity to exchange views about global needs. Our second program on April 7, Changing Climate: Uncertain Future, focused on the unique challenges of communicating climate science to the public (SDG 13). Why do the facts about the important environmental problem of climate change sometimes seem to be lost in discussions due to ideological or religious differences? Greg Fishel was joined by meteorologists Katharine Hayhoe from Texas Tech University and Walter Robinson from North Carolina State University, to look the facts and controversies surrounding climate change. This summer’s town hall, Environment – Economy – Entrepreneurship: Is Clean Energy Good Business?, was held on the evening of July 14. Mr. Fishel led a discussion about energy production (SDG 7) in a program that highlighted both liberal and conservative viewpoints on the topic of energy. Our audience gained the perspective that when it comes to environmental challenges, partisanship need not play a role in finding workable solutions. Our speakers were Jordan Kern from the Institute for the Environment at the University and Bob Inglis, co-founder of Republicen.org. We are excited about future programs as we look towards December and our next town hall focusing on preserving life on land (SDG 15). We know that the town hall format holds great promise for the Museum to effectively deliver information about the SDGs. These programs reinforce the fact that the UN goals may be global in scope but can start (and need to be embraced) at the local level.